Over the past three years I have travelled far and wide filming jazz bands and musicians at various venues including clubs, festivals, theatres and special events. In that time I have produced around 1,500 videos from which I have so far created well over 700 YouTubes. When time permits I enjoy browsing through them on my Jazz & Jazz YouTube Site. But rather than just keep them listed there I’ve decided on a new series of periodical Jazz&Jazz posts featuring a selection of my favourites. 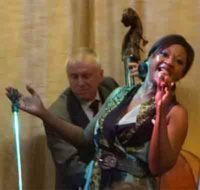 Not necessarily based on video quality – top quality isn’t easyily achievable at crowded jazz venues – but on shere enjoyment of the performances, the music, the appreciation of the fans, and the enthusiasm and rapport of the musicians and bands. 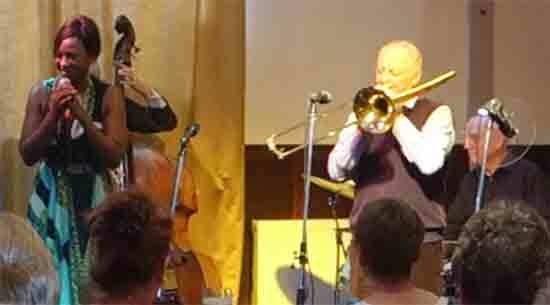 First in the series was “Davenport Blues” with Alan Gresty and Tony Pitt. Google Advertising: I permit Google Advertisements on my Jazz&Jazz YouTubes. I know these ads can be tedious and I would prefer not to. But the thing is, bit by bit if viewed for long enough they can earn much needed revenue to help finance my Jazz&Jazz activities. If you prefer to skip the ads but would like to help cover the costs of my endeavours for jazz, please use the donate button in the column to the right. It would be much appreciated as funds are urgently needed if I am to continue, and not curtial, my endeavours for jazz.